Remembered as one of the most forward-thinking engineers of his era, Dante Giacosa believed that Fiat’s small economy cars could be more spacious and better to drive if they switched from the traditional rear-engined/rear-wheel drive configuration to a front-engined/front-wheel drive setup. Although many accused Giacosa of copying Issigonis’ Mini, the engineer actually designed and patented a front-wheel drive drivetrain centered around a transversally-mounted engine in 1947. Another obstacle that stood in Giacosa’s way was Fiat’s management, who doggedly believed that the only way to build a small car was to put the engine behind the rear axle. Likely using the Mini’s success as leverage, Giacosa eventually managed to convince his superiors to give front-wheel drive a shot but there was catch: skeptical, Fiat executives ruled that the layout would first be tested by Autobianchi, a division formed in 1955 by Fiat, Bianchi and Pirelli. The rationale was that if the front-wheel drive car was a total flop it wouldn’t be directly associated with the Fiat name. Giacosa and his team quickly got to work on designing the Primula, the name given to Fiat’s first-ever full-production front-wheel drive car, and the finished product was presented to the press and the public at the 1964 edition of the Turin Motor Show. Giacosa mounted the transmission in-line with the engine in a bid to fix the issues that he found with the Mini, a setup that is commonly found in virtually all types of cars today. The Primula was introduced with a 1,221cc four-cylinder engine sourced from the 1100 D. Linked to a four-speed manual transmission, the four-banger generated 59 horsepower at 5,600 rpm and 68 lb-ft. of torque at 3,200 rpm. A double-barrel Solex carburetor was added to the four-cylinder the following year, bumping its output slightly to 65 horsepower and 96 lb-ft. of torque. 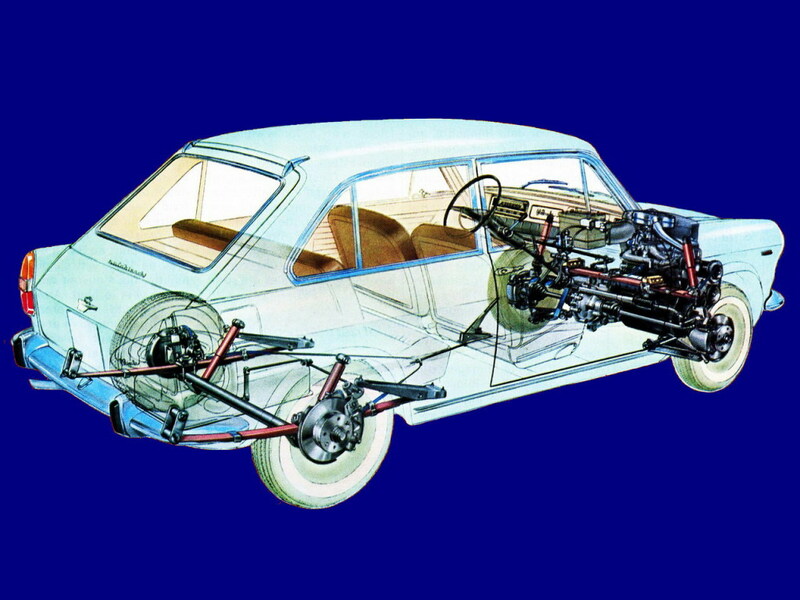 Four-wheel disc brakes came standard and, interestingly, Autobianchi had to equip the Primula with a hydraulic clutch in order to reduce the size of the bellhousing and fit the drivetrain transversally. 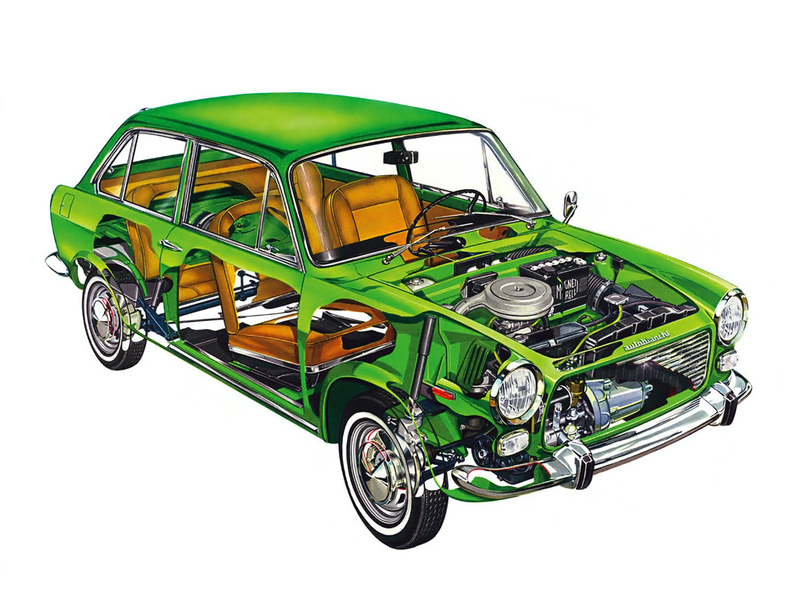 Autobianchi launched the Primula as a four-door sedan but the lineup was soon expanded with the addition of a two-door sedan, three- and five-door hatchbacks and even a coupe with a sleek roofline. Similarly, new engines were added to the catalog including a Fiat 124-sourced 1,197cc four-cylinder rated at 65 horsepower and 64 lb-ft. of torque and a 1.4-liter that generated a healthy 75 horsepower and 80 lb-ft. of torque. Borrowed from the 124 Special, the 1.4-liter was exclusively fitted to the range-topping Primula Coupe S. Finally, the Primula was given a mid-cycle facelift in 1968 that brought a number of changes including a smaller radiator grille. Fiat saw the Primula as a potential rival for its own cars, including the 850 that was introduced the same year. Ironically, both the Primula and the 850 were designed by Dante Giacosa. The Turin-based automaker ultimately got lucky because Italian buyers never really warmed up to the Primula and remained faithful to rear-engined cars for at least another decade. However, the Primula was relatively successful in France, where buyers were already driving front-wheel drive cars with hatchbacks. The press billed it as an Italian Peugeot 204 and as smaller version of the Renault 16. In 1969, the Primula five-door hatchback cost 10,836 francs while the 75-horsepower Coupe S retailed for 12,992 francs. To put those figures into perspective, that same year a Fiat 500 L cost 5,290 francs, an 850 Special cost 7,120 francs and a Peugeot 204 Grand Luxe cost 10,550 francs. The Renault 4 cost 6,712 francs and the Beetle started at 7,680 francs. The Primula was phased out in 1970 after about 75,000 examples were built. Its spot in the Autobianchi lineup was filled by the A111, a more traditional-looking three-box sedan that was roughly the same size and shape as the Fiat 124. Introduced in Italy in 1968, the A111 was powered by a transversally-mounted 1.4-liter four-cylinder engine that spun the front wheels via a four-speed manual transmission, roughly the same drivetrain that was found in the Primula Coupe S. The Primula’s drivetrain was also shoehorned in the Fiat 238, a medium-sized van aimed at the Volkswagen Bus. Although it was far from a success from a commercial standpoint, the Primula was a monumentally important car for Fiat because it ushered in the mechanical layout that nearly all of the group’s cars have used since. Fiat admitted that Giacosa had a point and timidly gave front-wheel drive a chance when it launched the 128 in 1969. Immediately, critics praised the 128’s sure-footed handling and its spacious interior, attributes that it inherited directly from the Primula. Tags: Autobianchi, Autobianchi Primula, Dante Giacosa, Fiat. Bookmark the permalink. It is good to read about the Primula as, given the historical importance of the vehicle, there is a paucity of information available about the car, particularly in English. If I may, I would like to add a few observations about the Primula. The car, was launched in 3 door hatchback form in November 1964 at the Torino motor show. effectively it was mid January 1965 before cars began to reach buyers. with the Primula 3dr in France. The Coupes at the show were prototypes and a number of significant changes were made before the Carrozzeria Touring production contract commenced. Carrozzeria Touring’s involvement with the Primula Coupe came to an end when the company ran out of money and closed down in Dec66/Jan 67. The Primula 4 door disappeared from the new car listings in March of 1970 and by summer of the same year production of the Primula range had come to an end. between the Ami 6 and the DS/ID. The GS could not come soon enough.